Beginning as a Production Assistant at the Commonwealth Film Unit in 1964, Tim spent forty years in the Australian film industry, which included working as a sound editor on the feature film, “Skippy and the Intruders”, and later as a feature film and television producer. He held senior executive positions in three Federal Government film industry agencies: Head of Production and Acting Producer in Chief, Film Australia, 1975-1981; Manager of the Industry Program, Australian Film Television and Radio School, 1990-91; and Director Film Development, Australian Film Commission, 1994-1998. His independent producer credits include the feature films “The Empty Beach”, starring Bryan Brown, the children’s adventure, “I Own the Racecourse” and “Do I Have to Kill My Child”, an award winning social drama for Channel 9 starring Jackie Weaver. He also produced the mini-series “Tracy” based on the cyclone which struck Darwin. 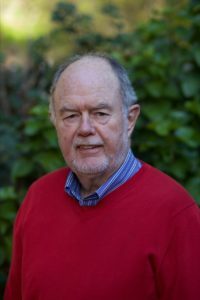 Tim also served continuously as a committee member on industry committees from the 1960s onwards, including the Film Editors Guild of Australia and the Screen Producers Association of Australia. He was Vice President, the Australian Film Council and the TV Make it Australia Committee. Outside the flm industry, Tim was a Governor of the Melanoma Foundation from1989 to 2016, and is currently a member of the Cancer Council NSW Ethics Committee. Tim has put his retirement hobby, stills photography, to work for the Bondi Surf Club, of which he is an associate member. He is also involved with Danceability, a charity which aims to enrich the lives of children and adults with intellectual or physical disabilities through dance and music in a safe, fun and caring environment. Tim considers it a great honour to have been elected as National President of the Australian Cinema Pioneers. As a result of changes to the Pioneers’ Constitution, he will serve for two years and hopes his contribution will match those of his distinguished predecessors. One of the first things he will be doing is asking members for their views about the Pioneers and any ideas they may have about its future. Tim has been a member of the Cinema Pioneers since 1996. His wife, Adrienne and their two sons, Tom and Dan, are also proud members of the Society.